Using the traditional low-relief engraving technique, a master engraver was able to produce an intricate image of a sailing ship against the backdrop of an old nautical chart on a base of white gold. To give it contrasts and depths, the engraving was tinted with black rhodium by oxidation. Fine cordage pattern can also be found engraved on the bezel and the bow. A total of 230 hours were taken to complete the entire engraving process. Powered by caliber 17’’’ LEP PS manual movement, this pocket watch, a unique piece, also boasts white enamel dial with white gold-applied Breguet numerals and hand-engraved hands. It is complemented with a white gold stand with decorations that recall the ropes, pulleys, and cleats on a black obsidian base set with a garnet cabochon. Like its name suggests, the inspiration came from the Cubist art movement led by Pablo Picasso in the early 20th century. Translating the artistic style on this dome table clock was the complex technique of cloisonné enamel beginning with tracing the geometric forms with 13.5m of gold wire measuring only only 0.15 x 0.6mm in cross-section. For the chromatic art resembling fireworks, the enameler used 51 transparent enamel colour, each meticulously applied on the plate to produce subtle effects of light, contrast and shading. Each plate is then fired no less than nine times at 840°C. The dial is equally exquisite – Breguet numerals in black enamel are paired with Breguet hands and hand-guilloched dial centre beneath blue enamel. A unique piece, the clock operates on caliber 17’’’ PEND mechanical movement rewound by an electric motor. Also known as wood mosaic, this ancient technique involves an elaborate and highly tedious process of arranging small pieces of wood into an intricate design. 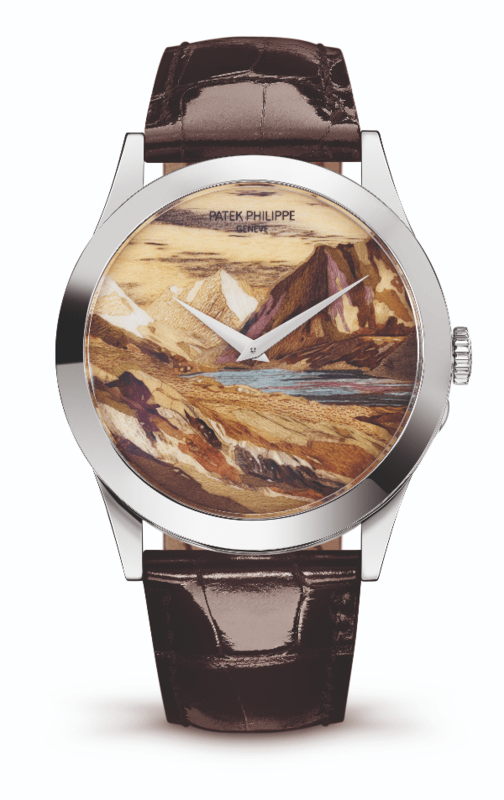 For this marquetry interpretation of the Alpine landscape for the Calatrava wristwatches, the artisan cut out pieces of veneer (thin sheets of decorative wood), assembled them and then fixed them onto a gold plate. There are two versions here. First is Ref: 5089G-059, also named Roped Alpinists, which shows skiers climbing the snowy slopes. It comprises 262 pieces from 27 species of wood of different textures, veining and colours. The second option is Ref: 5089G-060 or Lac d’Emosson mirrored after the painting by French geologist Jacques Debelmas. It is composed of 195 pieces from 22 species of wood. The Golden Ellipse has the distinction of being the second oldest watch in the Patek Philippe collection, after the Calatrava which debuted in 1932. Boasting an elliptical case, the model celebrates its 50th anniversary this year. To mark the milestone, the Swiss maison has endowed the 50th anniversary limited edition with two rare handcrafts, engraving and enameling. The black enamel dial serves as the canvas for the hand-engraved volute pattern. At the centre of this elaborate decoration is a motif similar to the Calatrava cross. The rest of the watch is as opulent as it you can imagine – think platinum case, satin-finished white gold hands, crown set with black onyx cabochon, and a diamond set in the caseband at ‘6’, the last apparently a feature common in all of Patek Philippe’s platinum watches. Limited to 100 pieces, the watch comes in a box that also contains white gold cufflinks with black enamel inlay. This article first appeared on my.asiatatler.com.